Distribution of string figures—native names—methods first recorded—ethnological value of string games—relations between finished patterns made by different races—relations between native methods—how string figures are made—different openings—nomenclature adopted—typical movements described—explanation of the descriptions and the drawings. 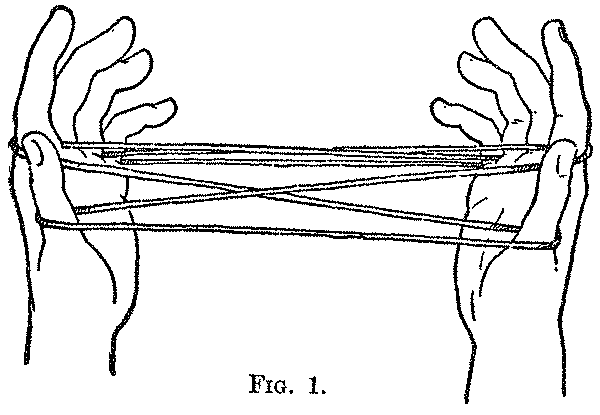 In our childhood we have all doubtless enjoyed the fascination of the game of Cat's-Cradle, and experienced a sense of being hopelessly baffled, when, after completing the series of familiar movements, we were at the end of our knowledge, and all our attempts to go on further ended in a complete tangle of the string. We did not know that the game, as we then played it, is one of a host of similar games played with a loop of string by savage or primitive people all over the world, and that, while our childish game is also known in many and widely separated lands, it is possibly only a survival of others now lost, and crude enough compared with the intricate and beautiful patterns devised by savage races. For many years travellers have been calling attention to the fact that a game resembling our Cat's-Cradle is played in various parts of the world; hence we now have some idea of its geographical distribution. We know that certain simple patterns are common in Great Britain, Europe, and the United States (in addition to the Indian games), and have been reported from India, Japan and Korea (Culin, 2, p. 30 and Weir) and China (Culin, 2, p. 30; Fielde, p. 87). Ehrenreich (p. 30) tells us that string games are played in South America, and I have found a few figures among the Batwa pygmies from Africa. Reports of their occurrence come chiefly, however, from explorers of the various islands of the Pacific Ocean, and from observers of the North American Indians. Thus we learn of string figures in Java from Schmeltz (p. 230); in Borneo from Wallace (p. 183), Haddon, and Furness; in Celebes from Matthes (p. 129) ; in the Philippines from my own studies at the St. Louis Exposition; in Australia from Bunce (p. 75), Smyth (Vol. I, p. 178), Eyre (II, p. 227), and Roth (p. 10); in New Guinea from Finsch (1891, p. 33), Rivers and Haddon (p. 151), and Turner (p. 483); in Torres Straits from Rivers and Haddon (p. 146); in New Ireland from Finsch (1888, p. 143); in the Solomon Islands and the New Hebrides from Codrington (p. 341); in the Loyalty Islands from Rivers and Haddon (p. 148); in the Fijis from Buchner (p. 269); in New Zealand from Diefifenbach (Vol. II, p. 32), Taylor (p. 172), and Tregear (1, p. 115; 2, p. 58); in the Hervey group from Gill (p. 65); in the Hawaiian Islands from Culin (1, p. 223) and Brown (p. 163) ; in the Caroline Islands from Furness; and in the Marshall Islands from Stephen. In America we learn of their prevalence among the Eskimos from Boas (1, p. 229; 2, p. 85; 3, p. 569; 4, pp. 151, 161), Hall (1, p. 316; 2, p. 129), Klutschak (p. 138), Murdoch (p. 383), Nelson (p. 332), and Tenicheff (p. 153); among the Salish from Smith (p. 281); the Tlingits, Tsimshians, and Kwakiutls, from Boas (2, p. 85); the Clayoquahts from Haddon; the Tewas and Zunis from Culin; the Pawnees, Omahas, and Cherokees from Haddon (5, p. 217); and among the Navahos from Haddon (5, p. 219) and Culin. Mr. John L. Cox has gathered games for me from the Klamaths, Tewas, Omahas, and Onondagas, and I collected string figures from the Navahos, Osages, Chippewas and Apaches at the St. Louis Exposition. Of the name "cat's-cradle," which is confined, of course, to the English game, no satisfactory derivation has ever been given (see Murray, N.E.D.). Comparatively few of the native names have been recorded. The Eskimos of Cumberland Sound call it ajararpoq; the Navahos, na-ash-klo, "continuous weaving"; the Japanese, aya-ito-tori, "woof-pattern string-taking"; the Caroline Islanders, gagai (the word also employed for the pointed stick used to open coco-nuts); the Hawaiians, hei, or "net"; the New Zealanders, he-whai, huhi, or maui; the natives of Lepers' Island in the New Hebrides, lelagaro, and of Florida in the Solomon Islands, honggo. In the eastern islands of Torres Straits it is known as kamut, in the western islands as wormer. The Bugis and Makassars of the Celebes call it toêká-toêká, from toêká, "a ladder." In some places in Australia it is named cudgi-cudgick. In North Queensland the various tribes of blacks have different names for it. The Kokoyimidir of Cape Bedford call it kápan (used also for "words, letters, writing," etc. ); the Ngaikungo and Ngatchan of Atherton, etc., morkuru; the Nggerkudi of the Pennefather and Batavia rivers, ane-inga; the Kungganji of Cape Grafton, manjing; the Koko-lama-lama of the Hinterland and coast of Princess Charlotte Bay, yirma; the Koko-rarmul of the same, mianman; the Koko-wara of the same, andai-ibi; the Mallanpara of the lower Tully River, kumai or kamai. Although the existence of the game has been known for years, no one had described how the figures are made until Dr. Boas, in 1888, recorded the methods employed in two Eskimo games. In 1900 Mr. Harlan I. Smith figured certain stages of two games played by the Salish Indians of British Columbia. 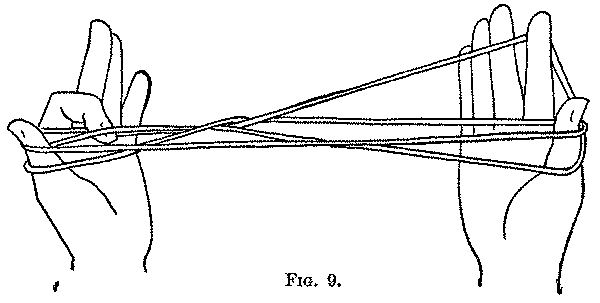 To Dr. W. H. R. Rivers and Dr. Alfred C. Haddon, however, must be attributed the real impetus given to the study of string games: their paper, published in 1902, gives us the first plan whereby all these intricate and difficult figures may be described so that anyone can repeat them; their simple and accurate nomenclature now makes it possible to record all future discoveries. A second paper, in 1903, by Dr. Haddon (5) on the string games of the American Indians, and a paper, in 1903, by the Rev. John Gray on several Scotch cat's-cradles, include, probably, all the descriptive records on the subject. My brother, Dr. William Henry Furness, 3rd, in his recent trip among the Caroline Islands, by following Drs. Rivers and Haddon’s directions and nomenclature, was able to record fifteen new and extremely interesting string figures; and at Dr. Haddon’s suggestion I visited the St. Louis Exposition several times in 1904, and was fortunate enough to secure thirty-one additional games from natives of the various races and tribes there congregated. Of the ninety-seven figures set forth on the following pages seventy-one are now described for the first time. To this list have been added drawings of a number of finished patterns obtained by other observers who did not record, however, the methods by which they were made. Just what value the study of the string games of different races will have to the ethnologist, it is difficult to say at this time. That evidences of racial or tribal relationship, or of migration, may be found in them, is not unlikely; that they bring us in closer touch with the folk-lore of savage people is already clear. While games in general of native races, and their connection with folk-lore, have by no means been neglected, string figures have appeared so difficult and require relatively so much time and such intimate relations for their collection, that, as yet, few careful observations have been made. Gradually, however, we are learning more about them; we know that many are closely connected with racial history and mythology, with traditional tales and fortune-telling; some are accompanied by muttered chants or songs; in others a consecutive story follows from movement to movement, or perhaps a touch or a word is associated with a certain turn or twist of the string. Concerning the relations, which the finished patterns produced in the string games of different countries, bear to one another, we know that a few simple figures are practically universal, that several others are formed by widely separated races, but that the great majority are peculiar to definite localities. We cannot suppose that the natives set to work deliberately to form figures of familiar objects, but rather that of the many patterns—formed by chance, in sheer idleness or from an inventive turn, whether under tropical suns or in ice huts during long arctic winters—only those were kept up and named which bore resemblances, however slight, to something connected with their daily life or prominent in their thought. How far tradition has preserved the figures unchanged, or time and constant repetition have altered their original form, of course it is impossible to tell. In the finished patterns we find, among all races, representations of men and women, parts of the body, articles of dress, of commerce, and of warfare; and of stars, and natural phenomena—such as storms, darkness, and lightning. Animals and plants are frequently reproduced, the names of course being conditioned by the fauna and flora of the locality, as, for example, the coral of the Pacific Islands, the cariboo of the Eskimos, and the owl, snake, and coyote of the American Indians. The methods employed by different races in making the figures and a comparison of these methods, are more interesting, and of more importance, than the study of the relations between the finished patterns. At present we can venture to express only the belief that, while many of the methods must be the same the world over, some of them will exhibit, in every region sufficiently isolated, marked peculiarities which, if enough figures are available, will enable us with certainty to recognize their locality. Thus the methods of Caroline Islands figures cannot be mistaken for those of the Navaho Indians, or the New Guinea methods for those of the other two. 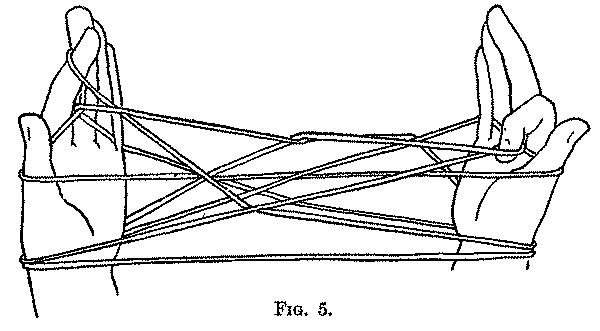 These string games may be roughly classified into those figures whereof the purpose is to form final patterns, supposed to represent definite objects; those which are tricks, wherein, after much complex manipulation of the strings, the entire loop is suddenly drawn from the hand by some simple movement; and those which are catches, wherein, when certain strings are pulled, the hand or some of the fingers may be unexpectedly caught in a running noose. Of course, there is no hard and fast rule of classification; several very pretty patterns may be converted into catches. String figures are made with a piece of string about six feet long, the ends of which must be tied together to form a single loop about three feet long. In some races a thong of skin is used; in the islands of the Pacific a cord made of cocoa nut fibre, or of human hair finely plaited, serves as a string. A woven cord which does not kink as easily as a twisted cord will prove most satisfactory; unfortunately it cannot be spliced, the ends therefore must be knotted in a small square knot or laid together and bound round with thread. 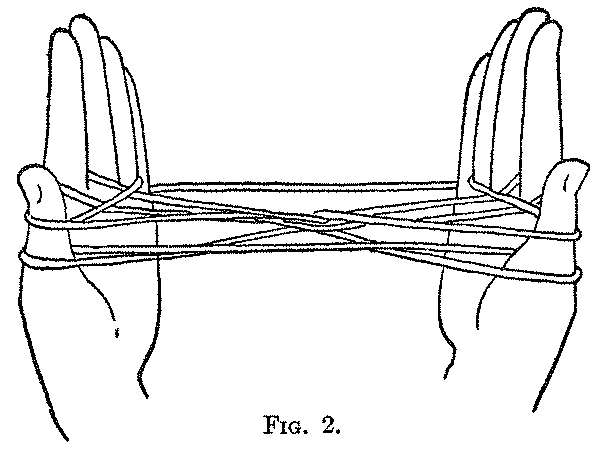 All string games begin with an opening, the object of which is to get the original loop so arranged on the hands that a number of secondary loops shall cross from the fingers of one hand to the fingers of the other, when the hands are held in what is called their usual position, namely, with the palms facing each other, and the fingers directed upward (Fig. 1). The ninety-seven figures described on the following pages show many different openings, but fifty-seven of them begin with the same opening. In arranging the figures, those with a common opening, and otherwise closely related, are gathered in one series, instead of being distributed into race groups; and in each series, as far as possible, simple figures are placed first. 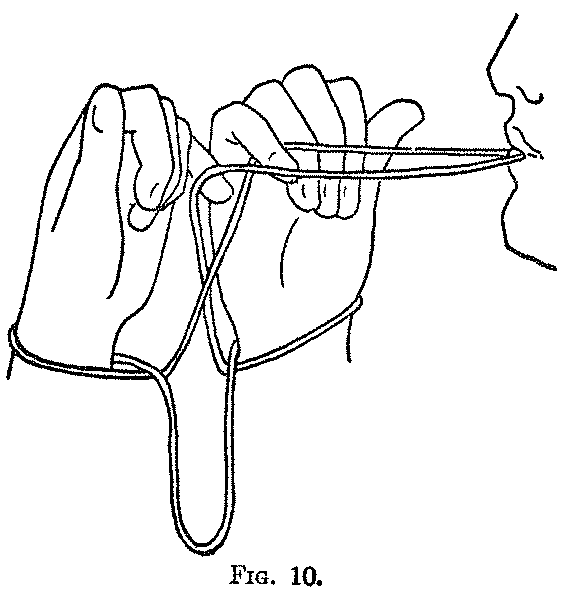 Every finger loop has, of course, two strings, and as a rule both these strings pass between the hands to form the strings of finger loops on the opposite hand; but sometimes one or both strings of a finger loop, before crossing to the other hand, pass across the palm of the hand or around other fingers and is a string, or strings, common to two finger loops of the same hand (Fig. 2). When you have arranged loops on the fingers, and the hands are held in the usual position, the loops are named from the fingers on which they are placed; thus, right index loop, left little finger loop, and so on; whenever a loop or string is changed to another finger, of course its name is changed to that of the new finger on which it is placed. The strings of the finger loops which leave the finger from the side nearest you are called near strings, and the strings which leave the finger from the side of the finger furthest away from you are called far strings; hence we have a right near middle finger string or a left far thumb string, etc. A finger may have two loops on it, in which case they are called upper and lower loops; and we have upper and lower near strings and upper and lower far strings. A string crossing the palm is a palmar string (Fig. 2). The movements which are necessary to form a final pattern are many, and in some cases most complex. They consist of a series of manipulations of the loops and strings which have been put on the fingers by the opening movement. Loops and strings are drawn over other loops and strings (Fig. 3), or under them; or are dropped and new ones formed by drawing out a straight string on one hand by a finger of the other hand (Fig. 4); loops are threaded through other loops (Fig. 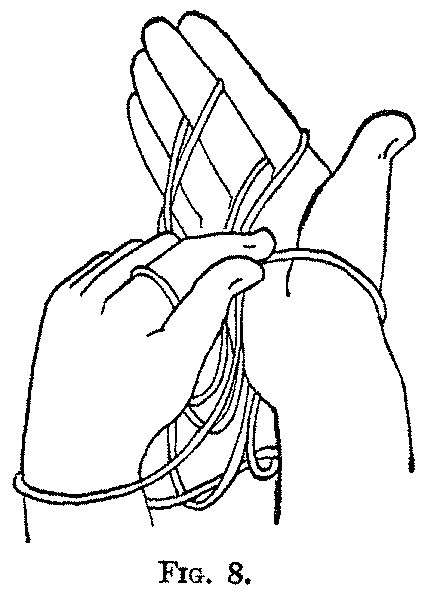 5), or twisted, or the loop on the finger of one hand is exchanged for a loop from a finger of the other hand (Fig. 6); and strings crossing between the hands, or in the centre of the growing pattern, are picked up by the fingers of one or of both hands (Fig. 7). It should be remembered that the object is to form the pattern on the hands, and, as far as possible, that the loops on the fingers of one hand shall be arranged by the fingers of that hand; the hands working together simultaneously. Of course, at times it is necessary for the fingers of one hand (usually the index and thumb) to arrange loops on the other hand (Fig. 8). 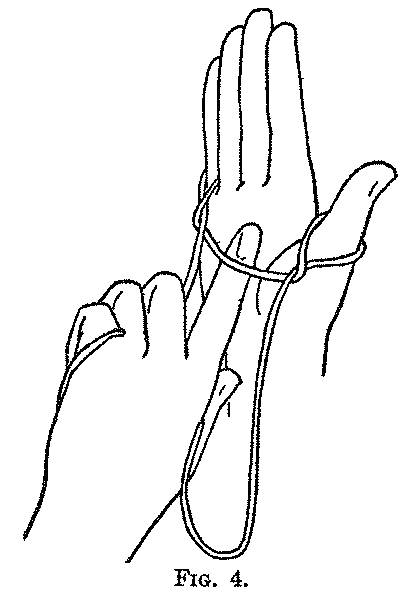 A loop or a string on the hand is arranged by a finger of the same hand as follows: pass each index toward you, over the upper far thumb string, and pick up from below on the back of the index the lower far thumb string, and draw it up and away from you by returning the index to its usual position (Fig. 9). 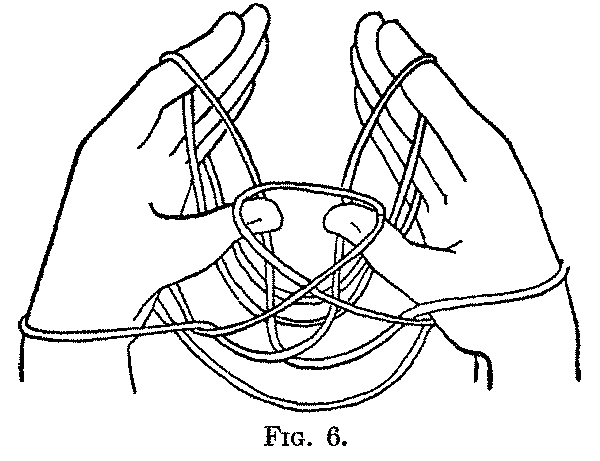 When you pass a finger down and under a string to pick it up, as in this example, you must naturally pick it up on the back of the finger; but if you pass a finger over a string to pick it up, you must pick it up on the ball of the finger, or in the bend of its first joint (Fig. 5). I have divided the description of each figure into a number of movements, every one of which represents a step toward the completed pattern; in this way it is easy to remember the order of the steps, and it enables reference to be made to one or more steps in a figure without the necessity of further description, for some figures are mere variations of others, and a few are made by combining movements of several figures with one or two new ones. The descriptions have been prepared with the utmost care, and have been tested on people who knew nothing of the game. There is, therefore, a reason for every direction which is given; some may seem superfluous, but these mark the points where experience has shown that a pupil is liable to make a mistake. None of the figures is very difficult, the really difficult ones are yet to be recorded, as we can see by examining the finished patterns from the Marshall Islands given at the end of the book. No trouble has been found in teaching string games to children of the kindergarten age, and the games can be made as interesting to all children as to adults, and at the same time aid materially in cultivating manual dexterity and a nice coordination of brain and hand. 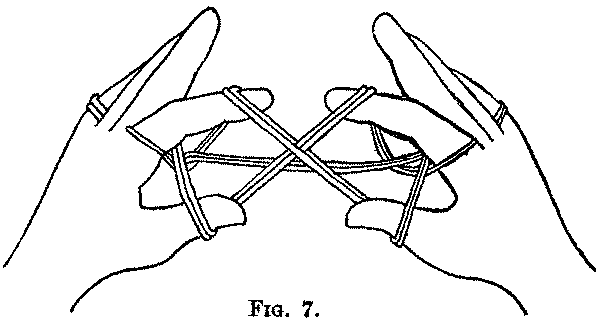 Moreover, two persons can play string games together, the right hand of one and the left hand of the other forming one figure while the other hands are forming an entirely different figure; in the same way many persons can play together. It should be remembered that the following descriptions follow exactly the methods used by the natives; doubtless other ways of forming the same figures exist, or can be devised, but I have not deemed it right, on the ethnological grounds given above, to change the methods shown to me at first hand or recorded by others. The invention of new figures is a fascinating diversion, and is of value because thereby a student becomes more expert and therefore better trained to observe and record native games. One pretty figure I invented, as I flattered myself, only to find out later that it is common among the natives of the Caroline Islands. A few of these invented games have been added at the end of the book merely as examples of what may be done. In the illustrations which accompany the descriptions we have the first serious attempt to show the successive steps in string games by pictures of the fingers picking up and arranging the strings and of the result produced by each movement. Heretofore, as a rule, only finished patterns have been drawn, or stretched out on cards for exhibition in a museum. Moreover, the illustrations represent the various steps as they are seen by the person making the figure. We have observed great care to have the strings and the loops, and their manner of crossing one another, accurately drawn. In a few figures only, where the strings run into small twists or knots in the centre between the hands, it has not been possible to trace individual strings throughout their entire course, but wherever this has been possible, even in the most complex figures, I think the artist has been unusually successful and has rendered faithfully the effects of strain and of deflection produced by crosses, knots, and twists. In illustrating a step which requires that each hand shall perform, independently, the same movement at the same time, in order to reduce the number of drawings without sacrificing any important stages in the process, one drawing, as a rule, serves to show two stages: one hand, usually the left, being represented as beginning the movement, the other hand as completing it (see Fig. 9). "A string passed over a digit is termed a loop. A loop consists of two strings. Anatomically, anything on the thumb aspect of the hand is termed 'radial' and anything on the little-finger side is called 'ulnar'; thus every loop is composed of a radial string and an ulnar string. By employing the terms thumb, index, middle-finger, ring-finger, little finger, and right and left, it is possible to designate any one of the twenty strings that may extend between the two hands. A string lying across the front of the hand is a palmar string, and one lying across the back of the hand a dorsal string. Sometimes there are two loops on a digit, one of which is nearer the finger tip than the other. Anatomically, that which is nearer to the point of attachment is 'proximal,' that which is nearer the free end is 'distal.' Thus, of two loops on a digit, the one which is nearer the hand is the proximal loop, that which is nearer the tip of the digit is the distal loop; similarly, we can speak of a proximal string and a distal string. * * * A digit may be inserted into a loop from the proximal or distal side, and in passing to a given loop the digit may pass to the distal or proximal side of other loops."